Road Trip to Narcisse Snake Dens- A Slithering good time! 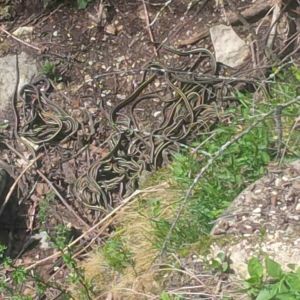 If you’re looking for something fun to do with the family, check out the Narcisse Snake Dens. It’s less than 90 minutes from Winnipeg – very easy trip and easy to find. If you’ve never been before, it’s the largest congregation of snakes in the world! People come from all over the world to visit them, while we were there even the Weather Network was there filming. There’s way over 100 thousand snakes there! There are several dens to check out, but you’ll find snakes all over the place. You’re allowed to pick the snakes up as long as you put them down where you found them. It’s a neat experience for sure! The snakes aren’t there very long, you still have most of May to go see them before they take off on their summer holidays. If you can’t go then, you can go in September when they return. The best part of this trip is that it’s all free! There’s really nicely maintained pathways to walk around, lots of super helpful employees too. 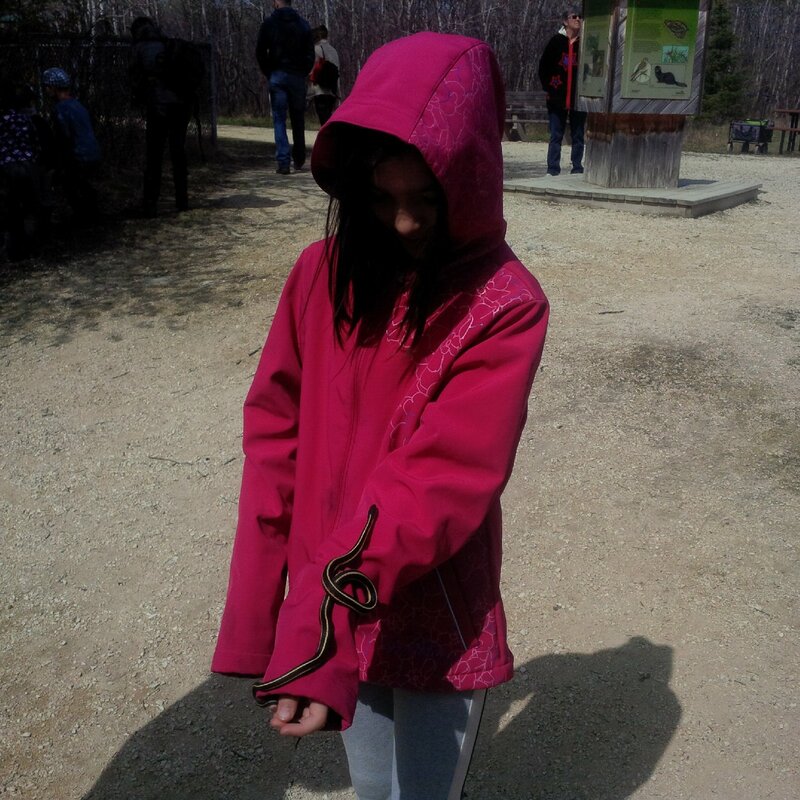 My daughter couldn’t decide if she wanted to hold a snake or not – it took a while but she finally did it. It was chilly while we were there but the snakes were still pretty active. 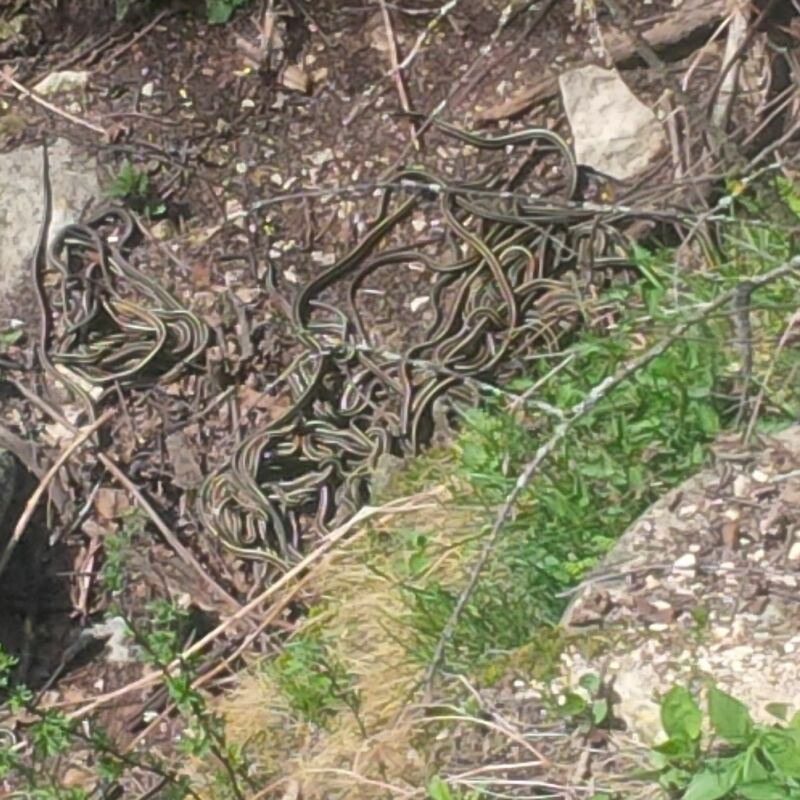 It’s amazing to see so many snakes – they ball up, fall off the little cliff walls all bunched together – lots of slithering around and it’s pretty loud – the employee told us it gets so loud you can hear the dens when you’re walking up if it’s sunny out. There’s also a lot of nice picnic areas with slabs of rock and a wooden wall around so nice and private too. And outhouse washrooms. We heard the woodticks were bad this year but we stayed on the paths and no one got any. Just tuck your pants into your socks if you go offpath, makes a big difference. Just make sure to do a full check after just in case too. You can find out all the info on their website, how to get there, best viewing times etc. I’d suggest packing a lunch and snacks since there’s not too much around there. The paths are good for strollers too, and you don’t have to walk the 3km either, there’s ways to cut across back to the start. If you’re unsure about picking up a snake the worst they’ll do is musk on you, or maybe poop on you – nothing horrible. The females are larger so maybe not pick those up as they can bite if they’re cold and agitated. The little ones are friendly and pretty cute! If you are interested in having me test out and review your product, or want to sponsor a contest please Contact me.